Belle will be coming back into our adoption program. Although they loved her, for personal reasons, the family she was placed with were no longer able to keep her. We are hoping the second time will be the charm. Belle is another kitty from Quebec. 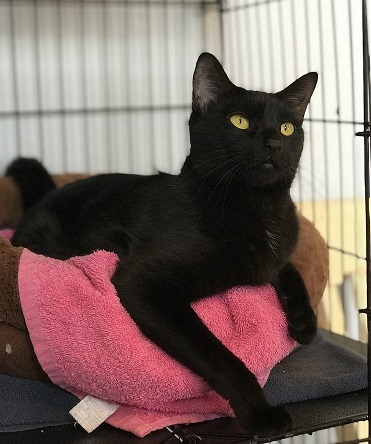 The shelter where she was being held was full and they asked if One Last Chance Rescue/Freedom Riders could arrange for new placements for a few kitties. We just happened to have the space so we said we could take Belle. A full day, several drivers and sharing a car with 9 other kitties preceded her arrival one Friday night. In spite of her very tiring day she walked right out of her carrier to say hello and get some attention. Belle is a two year old outgoing playful female kitty. She has been in a kennel since April so we expect her to “calm down” a bit after she finds a forever family but she’s probably not going to be a lazy bones any time soon. She is a BIG fan of knotty knots and crinkles balls and would just love to worm her way into someone’s heart.